So by now you have probably read in the description of our podcast that 3 Pagans and a Cat has no actual cat in it. Many moons ago, Car gave me a cat as a gift, an adorable black cat who was the runt of the litter at a local animal shelter. He was tiny with a ridiculously long tail and claws too long to sheath properly in his tiny black paws. He never did grow into that tail. Over time, however, it became clear that we would never be able to have a pet because it turns out that Car is very allergic. Shadow went to live with my mother in the country with her cat where he spent nineteen happy, healthy years hunting mice, birds and rabbits. 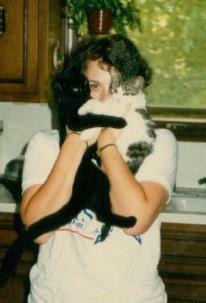 He was a loving companion animal and we got to see a lot of him over the years. There are still times when I’m at my mom’s place I can sense his sweet presence in the tall grass when I’m out walking the property. Fast forward a few weeks ago when Car, Ode and I were trying to decide what to call our podcast. 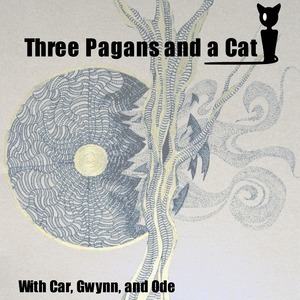 3 Pagans and a Cat (in honor of Shadow—so beloved by all of us) just popped into my brain! We all liked the name and the chance to include Shadow in our doings (however posthumously). So we are "3 Pagans and a Cat"...except no actual cat...save for the memory of a particular and beloved black cat always with us in spirit.